any number of successive terms of the series of natural number is a triangular number (ref. 3). 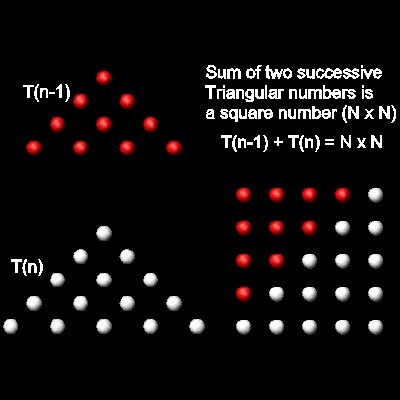 Greek mathematicians knew that two consecutive triangular numbers makes a square pattern. 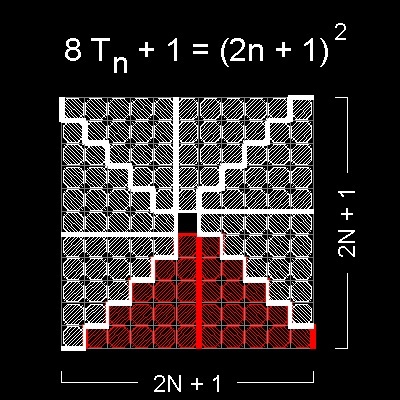 You can see the process in animation for N = 5 case. So we have the following relation. 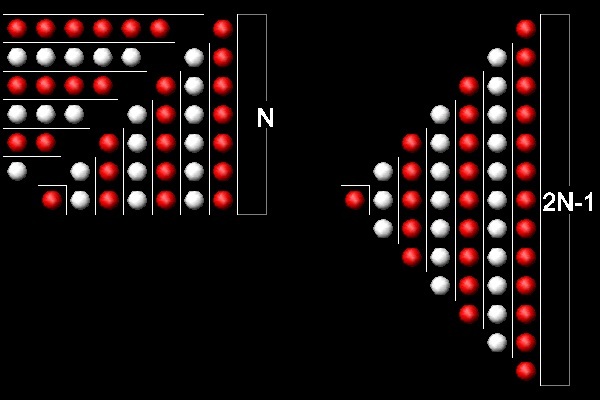 Note* : This program requires white_ball.dwg & red_ball.dwg . This result will lead us to the next visual demonstration . 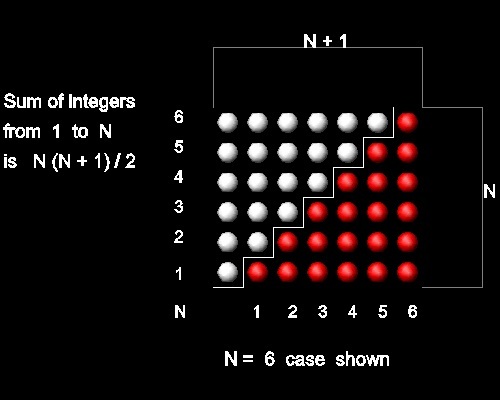 You can see the process in animation for N = 6 case. Another way to look at this is done by rearranging triangular numbers in a "staircase" fashion and think in terms of "oblong" number. According to Ref 3, the earliest Pythagoreans discovered the fact that 'oblong' number is double of a triangular number. Here 'oblong' number is of the type n(n+1). 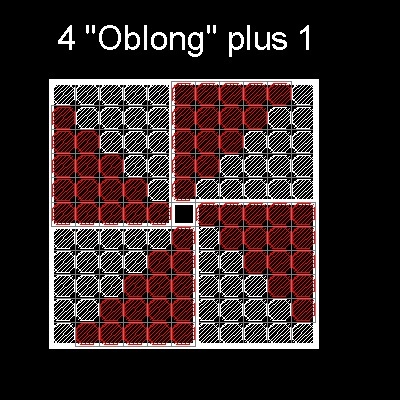 The Greek mathematicians also knew the connection between oblong numbers and squares,that is, 4 'oblong' + 1 makes a square. The figure in the left shows this fact. Since one oblong number is made up of 2 identical triangular numbers, this figure is saying that 8 triangular numbers + 1 = square number. If a red-tile stair block is merged with a white-tile block in the adjacent oblong block, it makes a pyramid-like block around one center square. Then the whole square can now be viewed as being made up of four of this new blocks instead of the 4 oblong blocks. The statement "8 triangular numbers + 1 = square number." is translated into the following formula. Note* : This program requires white_hatch.dwg . 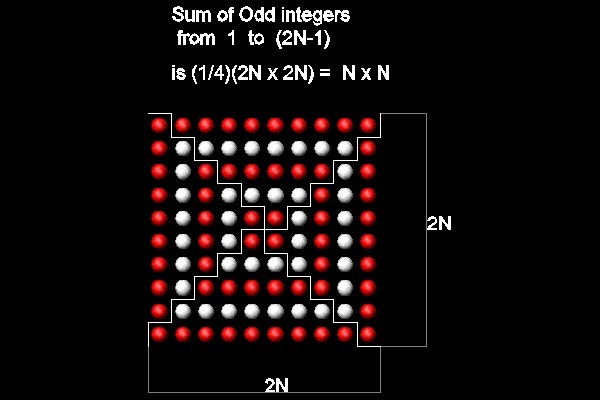 Sum of odd natural numbers from 1 to 2N-1 is N2 as shown in the figure below. 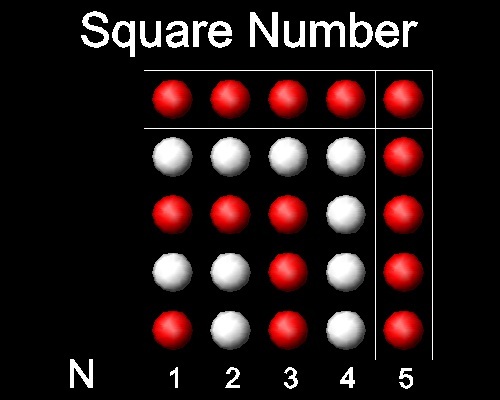 (Ref.3):"It is easy to see that,if we have a number of dots forming and filling up a square (say 16, as in the accompanying figure),the next higher square, the square of 5, can be formed by adding rows of dots round two sides of the original square as shown. The number of so added is 2.4 + 1 = 9. This process of forming successive squares can be applied throughout,beginning from the first square number 1. The successive numbers added to the 1 are, as shown in the next figure,3, 5, 7, .....(2n+1), that is to say,the successive odd numbers. 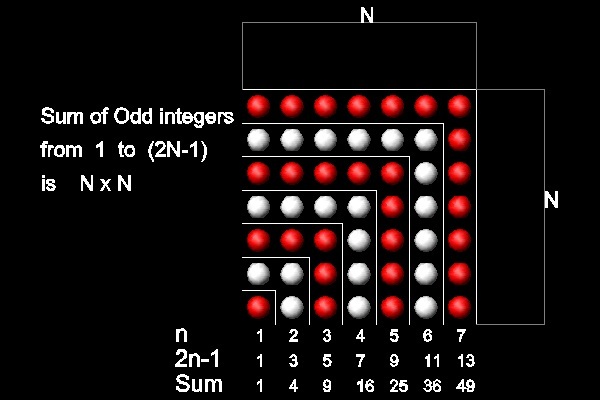 The method of formation shows that the sum of any number of successive terms of the series of the odd numbers 1,3,5,7 ....(starting from 1) is a square, and in fact 1 + 3 + 5 + ....+ (2n - 1) = n2,while the addition of the next odd number (2n + 1) makes the next higher square, (n+1)2. All this was known to Pythagoras." This program requires red_ball.dwg & white_ball.dwg. and rotate 90 degrees clock-wise to form a triangle in the right. From left to right , the sequence is still 1, 3, 5, ... , odd numbers. This will lead us to the next visualization scheme. 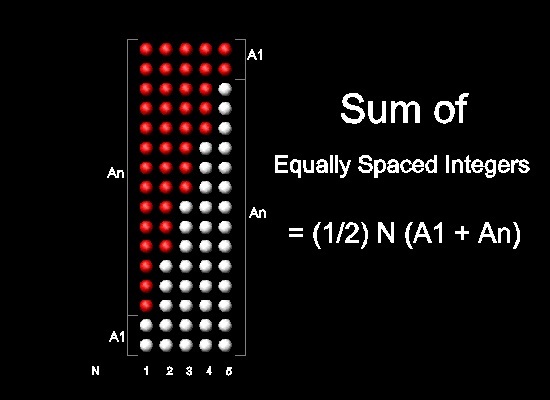 (Ref.1)The arithmetic progressions discussed above can be treated as special cases of sum of N equally spaced numbers. When A1 = 1, then d=1 is the natural number , and d=2, odd numbers. In general, A1 and d are real numbers. They need not to be integers. for A1=2, d = 3, N = 5 case. Conway,J.H., Guy,R.K. : The Book of Numbers. Springer-Verlag,New York, p.33, 1995. Nelson,R.B. : Proofs Without Words: Exercises in Visual Thinking. MAA, p.69, 1993. Heath, Sir L.H. : A manual of Greek Mathematics. Dover Edition ,p.43, 1963. Originally published in 1931. Wells, David: The Penguin Dictionary of Curious and Interesting NUMBERS. London,England: Penguin Books, p.85, 1986. Wells, David: The Penguin Dictionary of Curious and Interesting GEOMETRY. London,England: Penguin Books, p.198, 1991. Dantzig,Tobias: NUMBER, The Language of Science. New York: The Free Press, p.41-43, 1930.